After the Mitty we thought we were golden. We upgraded the brakes on the Grand Sport and changed the gear ratio on Edward’s 68 for Road America. Neither change worked out. It rained about half the weekend, so dry track time was at a premium. 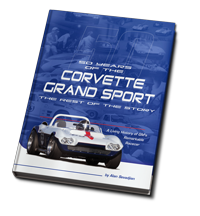 With the Grand Sport, we wasted the first session with brake bias issues. The next session we had a flat on the first lap. The following session was rained out and on the first lap of the qualifying session a car blew up in front of us and dumped oil right in the middle of the 150 MPH kink before Canada Corner. We spun and blew a tire, but didn’t hit anything. That was our second flat tow back to the pits for the weekend. The qualifying race was rained out. The Chief Steward had to give us a starting spot for the race because we never got in a timed lap to earn a grid position! Even with all our screw ups this weekend, we managed to finish ahead of a lot of exotic racecars. In SVRA sanctioned events, the Grand Sport runs in Group 5 with the Can-Am cars and other GT Prototypes like the 7-liter Ford GT’s and Cobras. 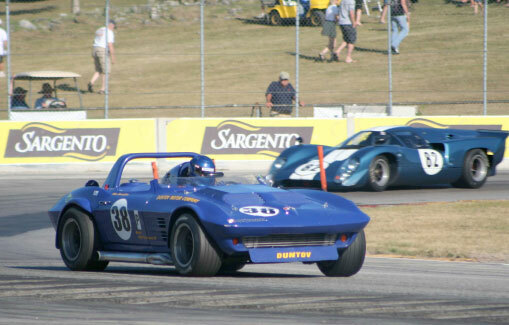 ‘Production’ Corvettes run in SVRA Group 6. There were a lot of really good cars in Group 5 this year, and we managed to finish ahead of all but four of the Can-Am Lolas and McLarens. We never got the car right with the new brakes, and it was obvious that with the car setup we had gone in the wrong direction since Atlanta. Turn 5 can get crowded at Road America. This was Edward’s first race at Road America, and he had car issues as well. He also had a flat tire that took out his first session. Our tire supplier replaced the flat with a 7 inch Goodyear on the Right Rear while the Left Rear had the correct 8 inch Goodyear. That took out Edward’s second session! During the qualifying race he managed to get one clear lap in, and that was good enough to put him on the Pole for the Group 6 race. We only had a tenth of a second on the second place qualifier, Chris Hines. Edward led the first two laps of the feature race, but unfortunately Hines forced Edward into the sand trap outside turn 5 on the third lap. I had a feeling that might happen and I had warned Edward that was where it was likely to happen. 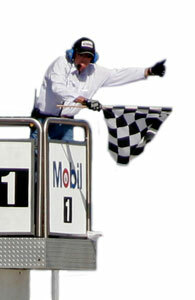 Normally when he is racing and I am not, I am with the mechanics on the pit wall, but for this race I was in the grandstand at turn 5, and sure enough it happened as predicted. It was our fault for not being enough ahead of Hines to stay clear, and we don’t intend to be that close next time.